3/20/2009 - Finally a high performance air filter for your genset or auxiliary sailboat engine that replaces the metal screen, foam or paper stock air filter. Ideal for small engine packages with air intake ports up to 2 in diameter, this filter is washable up to 4 times and easily mounts to a round air intake port using a hose clamp. Walker Engineering continues to expand its marine air filtration line with a new Economy Air Filter for your marine diesel genset or auxiliary sailboat engine. The unit is rated for diesel engines up to 50HP/65 KW, and it�s patented multi-sized throat fits engine intakes measuring 1 1/2�, 1 ��, and 2�. 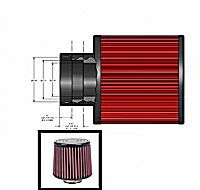 The throat design allows the user to trim the filter and install easily on the engine air intake without additional adapters or bushings. It�s the perfect replacement for metal screens, or open sponge air intake covers found on many engines. Yacht owners seeking to eliminate oil mist and fumes from their engine rooms and cockpit areas should also ask about Walker�s Universal AIRSEP kit for small auxiliary engines and gensets.